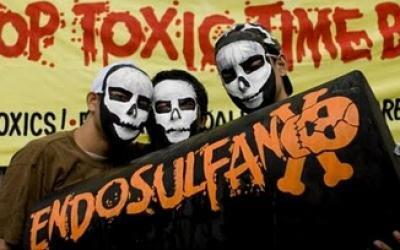 Just as the name suggests, Endosulfan is an insecticide. After being banned in a number of countries, India finally approved its usage. Where else do we test it other than Kerala? Even after a lot of studies informed that usage of Endosulfan would lead to cancer and stop human development, the Central Government gave a go ahead. There have also been rumours that these patients aint victims of the insecticide instead suffering from Handigodu disease. The Kerala government kept requesting the Central Government that this is infact a harmful chemical. The public protests were also on a high. One of the worst affected was the Kasargod district where entire families started showing signs of mental imbalance. The central Government turned a blind eye to the entire episode and also blaming the then Communist led government in Kerala for its anti-development crusade. The central government went a step further, they filed a case against the kerala government’s request in the supreme court to ban Endosulfan. The Central Govt. mentioned that it’s a tried and tested chemical and doesn’t have any adverse effects on human beings. The way things are going for the centre-POOR AINT HUMANS for them. On May 13, the supreme court banned the usage of endosulfan but on August 2, 2011, the Centre filed a counter petition saying that the victims in Kerala are suffering from a totally different disease and it should instead promote the usage of endosulfan. The contradictory part of this is that when A.K. Anthony, (the current Defence Minister) the then Chief Minister of Kerala had banned the product and as of today he is mute. No one has heard from him. The Centre has given compensation to all the victims but why add the count. The centre anyway doesn’t listen to the poor, let’s not further trouble them atleast.